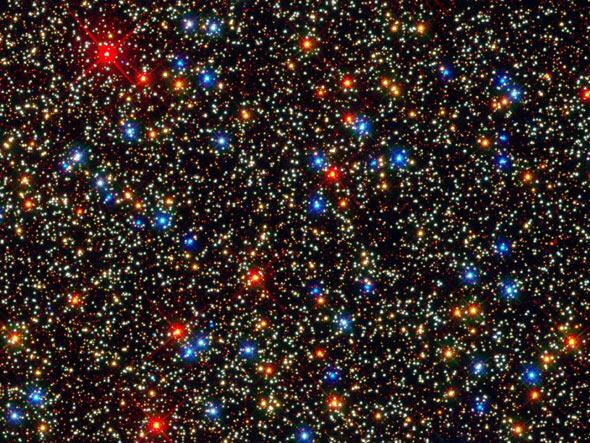 The stars in the globular cluster Omega Centauri. Now that only star is mine. Stars are the building blocks of the visible Universe. They’re the fundamental unit, like atoms in matter. Stars make up galaxies, and galaxies make up the Universe. They are also why we’re here, quite literally. Stars make planets, and stars make the elements that make you and me. We owe our existence to stars. So understanding them is kinda critical to understanding, well, everything. Wanna know more? Then do I have a Crash Course Astronomy episode for you! Mea culpa: In the “Focus On” segment, I say that the Sun’s spectrum peaks in the green. To be fair, it peaks in the blue-green part, and atmospheric absorption makes the light that hits the ground peak more in the blue. But when you add it all up, the Sun emits more green than blue light, which is what I meant. I should’ve been more clear. I wrote about why there are no green stars in a post a few years back. Not that there aren’t green objects in space. But those are different. Comets can look green too. And don’t confuse any of this with Hank Green in space. That’s a completely different topic.